It’s not what we have but what becomes of us. Find your work optional lifestyle. to accomplish your life goals. A very important feature of our proprietary process The Swan FORMula™ is partnering with like-minded CPAs and Attorneys. We recognize that for a financial plan to be complete and sustainable it must also address issues around tax planning, risk and debt management and estate and legal concerns. Our partners are a key part of the process and ultimately help our clients reach their full potential around financial independence. Now in its fourth decade of service to quality, independently owned broker-dealers, First Clearing maintains a leading position in empowering firms to help their clients achieve financial success. Its team of experienced professionals offers some of the industry’s best thought leadership and innovative approaches to business advancement. As an affiliate of Wells Fargo, one of the world’s most admired financial services firms, First Clearing provides our clients with access to a full range of investment, advisory and banking products; industry-leading research; alternative investments; fixed income, lending, retirement and trust services, risk-management and compliance support. Headquartered in St. Louis, MO, First Clearing is a member of the New York Stock Exchange, NASDAQ and other major exchanges. Founded in 1982, Prospera Financial Services, member FINRA/SIPC and a registered investment advisory, has grown rapidly and strategically and now has $8 Billion in assets under management. Prospera offers access to all of the products and services of the largest broker-dealers in the country while assuring our clients of the service-driven culture of a boutique firm. 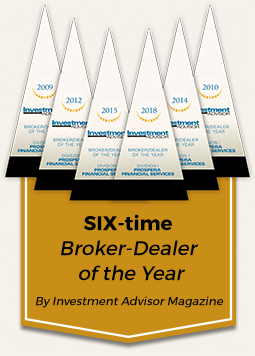 Headquartered in Dallas, TX, Prospera was named Broker-Dealer of the Year by Investment Advisor magazine in 2009, 2010, 2012, 2014, 2015 and 2018. Brokerage and Advisory accounts carried by First Clearing. An affiliate of Wells Fargo and company. Little & Associates Wealth Management does not render legal, accounting, or tax advice. Please consult your tax or legal advisors before taking any action that may have tax consequences. © 2019 Little & Associates Wealth Management. All rights reserved.